As we move onto the fourth year of the iPad it amazes me that everyday more apps are developed and developers continue to come up with new ways and ideas to communicate educational information. Since I have been reviewing since the inception I have some of my favorites that have remained my favorites because they have been updated and changed because of consumer requests. One of these apps is from a series by 24×7 digital LLC known as the TeachMe series. They start in preK and it go until third grade. TeachMe 1st Grade and TeachMe Kindergarten each $1.99 have been staples in my classroom. Many of my students are working on a K-1st grade level making these perfect for teaching addition, subtraction spelling and Dolch Sight words. Both kindergarten and first grade teach similar topics but are geared specifically for the individual grade. As always you want to set your settings before staring the app. In this app it is done a bit differently. After you input your students you go to your players. As you can see you can have your entire class use the app if you are a center based classroom. Next touch the student’s name to set up your student’s profile. There are rewards and the number of questions needed to be answered for mastery. If you are just teaching math or spelling you can shut off the other features. In first grade handwriting is incorporated as part of the lesson. If the student can not write or have dysgraphia you can check off the virtual keyboard. If you want to check the student’s data you have the option to check the TeachMe Topic. It will give you the current level, total number of questions- how many the student has learned and how many they have not learned. It also allows you to view the questions the student had difficulty with. If you feel the current level is too easy there is the option to advance to the next level allowing those students who need more of a challenge an opportunity to move on. The students love the math problems because they are interactive. When there is a subtraction problem there is a horizontal math sentence and pictures above for the students to manipulate. If the problem is 9-2= the student taps the minus sign two items fall in the garbage can. The student needs to count the remaining items with the help of a voice that count with the child. In first grade the child taps a pencil when they complete the math problem and writes the number 7. If the child needs help they can tap the question mark and learn how to draw the answer by tracing the number. The same is true with spelling, the child is given a picture and then needs to spell the word. If the child does not know how to spell the word the question mark will help the student spell the word. 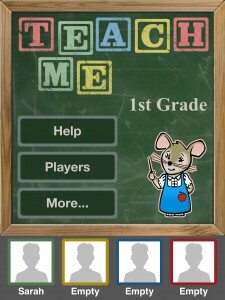 If you are looking for a way to help your child who may be struggling with basic addition, subtraction, spelling and sight words TeachMe gives you 4 apps in one with the ability to see how your student is progressing. This is one of the iPad education classics and a top favorite for my students. The price is right and it meets Kindergarten and First Grade Common Core Standards. K- Solve addition and subtraction word problems, and add and subtract within 10, e.g., by using objects or drawings to represent the problem. K -Read common high-frequency words by sight (e.g., the, of, to,you, she, my, is, are, do, does). IEP Goals: The student will rote learn addition facts up to :number. Word Wizard $2.99 meets the needs of many children with a variety of disabilities and meets the Common Core Standards for all students. Before you start customize your settings. Do you want ABC keyboard or a QWERTY keyboard? Do you want upper or lower case? Do you want to hear phonics? If you want more setting such as font size, highlighting the word,, animation between words and more these are all available to you. If you have a child in who is in Pre k-Kindergarten this app identifies the letters of the alphabet each time you touch a letter.One of the key attributes are students touch the letter hear the phonic sound and it’s letter sound giving the child command of the board and letting them create sounds. As students get older the app is has built in spelling lists from Dolch Words to 1000 most Frequently used words. This meets Grade one‘s Use conventional spelling for words with common spelling patterns and for frequently occurring irregular words. The app also allows students to create their own lists given to them by their teacher meeting second grade Common Core, Generalize learned spelling patterns when writing words (e.g.,cage → badge; boy → boil). The teacher can follow the spelling Common Core using this app as each grade requires students to learn another level of spelling. I think this app is appealing pre K- grade 5 because of the colors and presentation. Special needs students who are older may enjoy because it has large tiles and makes letter sounds. In my class I use it with my girls who are 14 and 15. They love the rainbow background and making words. They like the ability of making 5 word tests and the sense of accomplishment. As we go on in the blogs there will be other spelling apps for older students. All around though this is a great app with clean features, clear phonics, large alphabet keys for students who may have fine motor issues.